Hosted by Tony Hughes AKA TonyH1212 on 2017-09-15 is flagged as Clean and is released under a CC-BY-SA license. Well I’m back again, as I said in the show I did about Raspbian x86 on the Lenovo x61s, I was interested to see how the OS would perform on what I now class as very old hardware in the form of a Pentium 4 tower. We have a spare tower at the Makerspace which gets used to test low resource operating systems to see if they live up to their name, so on Saturday (yesterday as I write this, but a few weeks ago by the time this show goes out) I put the x86 Raspbian image on to this tower to see how it would perform. Tower specifications are: Pentium 4 2.8Gig CPU, 2Gig DDR Ram and a 40Gig HDD, which in its day was a very useful bit of kit, but technology has moved on and most people wouldn’t consider it any use as a working PC today. First problem I encountered was the DVD drive was duff and I didn’t have the image on a flash drive. Luckily I did have my trusty USB DVD in the bag, so I hooked that up, booted into the boot menu and set the disc off loading the OS. I won't go into this again as I ran through the install process last time, HPR 2362, but the install went well and I was left with a new install of Pixel on the tower. 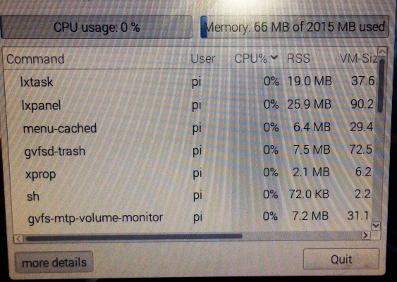 I went through the new install process and was left with an up to date and password secure PC, I then rebooted to check what the resource use was at first boot, which I was amazed was a consistent 66mb of RAM, and about 1% CPU use. Using the Chromium web browser pushes up RAM usage over a 100 but it was smooth and easily coped with navigating to resource hungry sites such as YouTube and the BBC. So first test passed. I next opened a Word document in LibreOffice, this took about 10seconds to load but once open was perfectly usable with no lag, so should provide a good office capable PC. So you can use the Web, Write documents, it has an email client or you can use web mail. And it’s not painfully slow, this PC would now make a very usable homework/first computer for any child, or a computer for an older member of the family that just needs to keep in touch with family and friends without breaking the bank. In fact you could probably pick up a working tower off the likes of Freecycle/Freegle for £0 and you may even get a small 17”/19” TFT monitor from the same place. Yes it’s not as energy efficient as the latest kit but as I said last time the cost of a new PC/laptop can buy a lot of additional electricity in the time you may run it before it finally expires. For some reason I hadn't considered this for older hardware. Thanks for the post and idea. I did the same thing with a very similar P4 computer. It does eat some electricity, but it is substantially faster and has more inputs and outputs than an original Model B Raspberry Pi. This could make for a more enjoyable experience learning to use a Pi since it can use USB persistence and be utilized on nearly any PC. Since most of the software is the same it could be a great way to make up for a a lack of funds to fill a classroom with Raspberry Pi machines. Nearly any donated PC that still runs could be made to work even cheaper than buying any of the Pi computers. People could rotate so if they want to experiment with the GPIO pins or other Pi specific components they can have a chance, while other won't have to sit around and wait for a Pi to become available. The new version of Raspbian x86 Stretch should be coming out very soon.